Celebrating the Classes of 1969, 1974, 1979, 1984, 1989, 1994, 1999, 2004, 2009 and 2014. Join us for cocktails, food, and networking and learn about Georgetown Law's Business Scholars Law Program featuring speaker Stephen P. Hills, Visiting Professor and Founding Director of the Business Law Scholars Program and Former President and GM of The Washington Post. 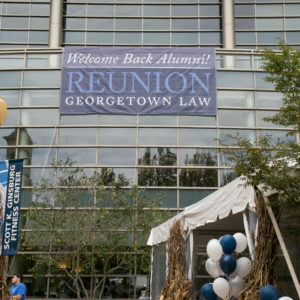 Join us on campus for the 2019 Georgetown Law Reunion, celebrating the classes of 1969, 1974, 1979, 1984, 1989, 1994, 1999, 2004, 2009, and 2014! Join us for a memorable day at the highest Court in the land. Apply for admission to the Bar of the United States Supreme Court!